Cornell University requested a custom version of our Burton Judson chair for the castle-like Risley Hall. By eliminating the finials on the top of the back posts, and adjusting the back slats to frame a large central slat, the Risley chair was born! 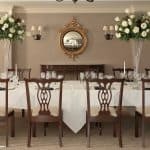 Its Gothic styling augments the grandeur of dining halls and meeting rooms alike; its unbeatable look embracing historic mystique for a traditional flair. The critical front and rear seat joints are made with our proprietary Eustis Joint®, which guarantees the Risley to last for 20 years minimum. The Risley is also one of our stacking designs, with the ability to stack up to 8 high for moving convenience.